Content marketing has long been the way to create a relationship with prospects you’ve never met. But content marketing is hard for many life science organizations to create, and it can be even harder to sustain this effort. This month, I want to share a “content marketing hack”—a trick to make it easier to harness the knowledge of your subject matter experts (SMEs). It will still take some work, particularly as you get started, but if you’re disciplined, this hack will help you produce thought leadership on a regular basis. Three trends that are affecting you, your prospects and your clients. I was interviewing the customers of one of our clients last week. We do this to get a fresh perspective on our clients’ performance. These interviews reminded me of three trends that are only growing more pronounced. When we look at them together, there are some clear implications for your organization’s marketing. And once you understand these implications, you should be acting on them. That’s what we’re doing at Forma: we’re acting. Over the course of the next several months, we’ll be bringing you along on this journey as we practice what we preach. But to begin, let’s take a closer look at these three trends—forces that are affecting you, your prospects and your clients. “And that’s important to you?” we asked. Another customer made similar comments. These comments exemplify the trends that I’ve been noticing. Trend #1: Time-starvation is growing. The world is getting faster. At the risk of sounding like a curmudgeon, it’s ironic that all the technologies created to increase efficiency don’t end up giving anyone more time. Instead, now there’s more to do, in less time. Your clients are time-starved. Your prospects are time-starved. 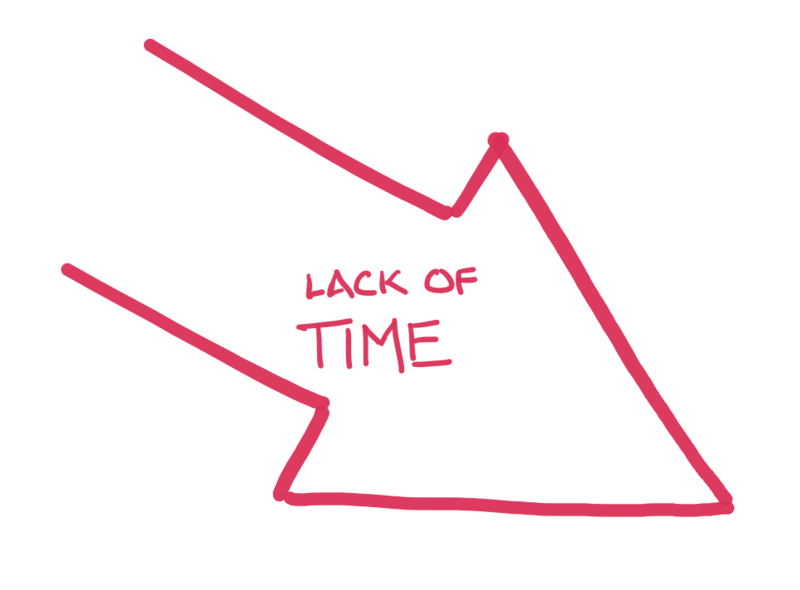 Your subject matter experts (SMEs) are time-starved. And if you’re honest with yourself, you probably are too. Figure 1: The first trend that affects your team, your prospects and your clients? 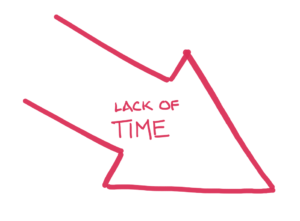 A lack of time. Trend #2: The number of choices is growing. 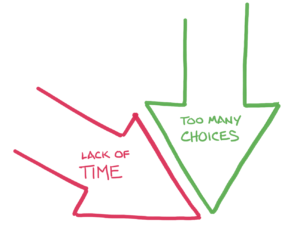 The number of choices is growing, in some cases exponentially. Don’t believe me? Think about something you should know well, like marketing. What’s the right channel to reach your audience? Three decades ago, there were only a few channels: print advertising, broadcast, trade shows, direct mail. Today—in social media alone—there are almost a dozen possible channels. Not to mention all the other channels that you can use, both old and new. How do you pick the right one? You can use your experience—which you can sharpen through repeated trial and error, right? But that takes an immense amount of time. And while you’re messing about, trying to make the right decisions, your competitors will be eating your lunch. Okay, picking the right mix of channels is something you should know well. Now, let’s imagine a situation where the choices are more confusing. Put yourself in your customers’ shoes. Pick a topic that’s related to your firm’s offering, something that your customers don’t know too much about. Within this topic, there are lots of choices. And your competitors are touting one solution, and you’re promoting another. 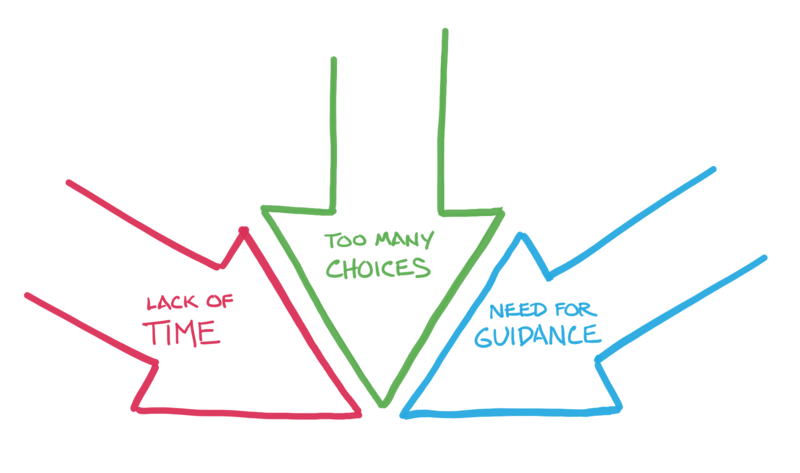 Your prospects aren’t as familiar with these choices, or which one will best position them for the future. And while you think that your offering is different and better, it’s probably not so obvious to someone who doesn’t think about this topic night and day, that is, the prospects who are looking in from the outside. The result: they’re just confused. As the psychology professor Barry Schwartz has pointed out, too much choice can be paralyzing. 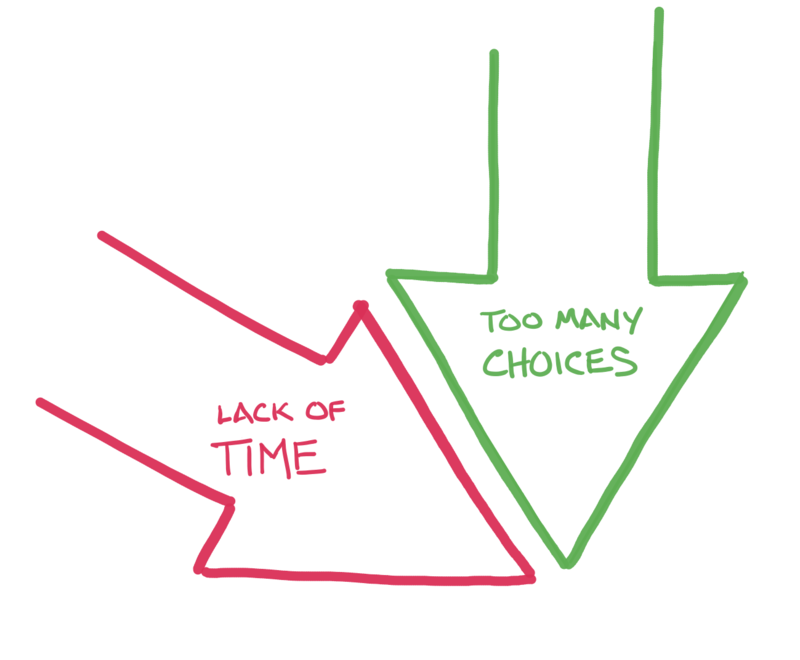 How can your prospects make the right choice? They could use their experience, which they could sharpen through repeated trial and error, right? But that takes an immense amount of time. And while they’re messing about, trying to make the right decisions, their competitors will be eating their lunch. The number of choices is growing. The right path is anything but clear. Figure 2: The second trend that affects your team, your prospects and your clients? Too many choices. Trend #3: Your customers (and your prospects) are hungry for guidance. Your prospects and clients need help making sense of the world. It’s not that they’re stupid; but time is tight and the options can be overwhelming. 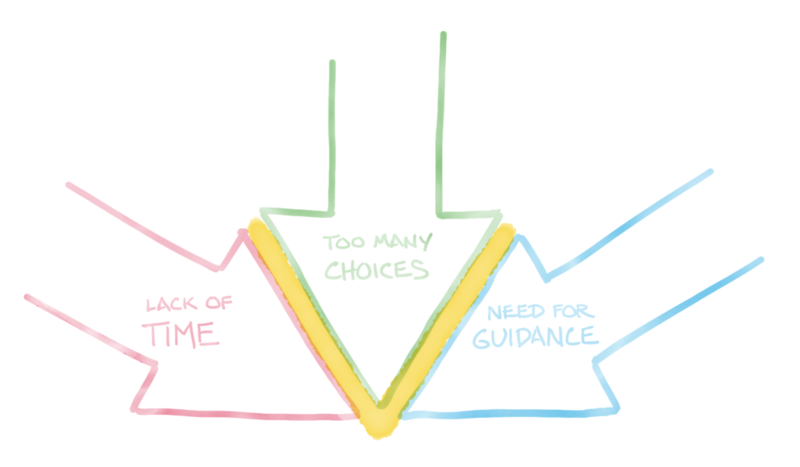 When the choices feel confusing, they need guidance. And if they can find a source for useful insight that they trust, they’ll gladly pay for this insight, with their attention, with their trust, and ultimately with dollars. Figure 3: The third trend that affects your team, your prospects and your clients? A hunger for trustworthy guidance. Now let’s put these three trends together and see what they mean for you. Start with the fact that your prospects need guidance, now more than ever—guidance which you can provide in the form of thought leadership. But your thought leadership won’t exist in a vacuum. So it has to be engaging enough to stand out from the rising flood of competing thought leadership. And beyond standing out, your thought leadership needs to help your prospects think about the world differently, giving them context to make sense of all the choices they’re facing. But this thought leadership must also be easy to consume, because your prospects are time-starved. And on top of that, this thought leadership should be easy to create, because you and your team are time-starved too. So what’s the obvious conclusion? You need video. Figure 4: V is for video. If you read between the lines, the implication of these three forces is clear. You need to be producing thought leadership video. It’s not obvious you say? Let me break it down. Video has many advantages when it comes to creating and conveying thought leadership. For instance: Video can pack a lot of information into a short amount of time. Google ranks a site with video over one without. Video helps viewers retain information, because it is tuned to the ways our brains are wired (by combining visual plus auditory input). Sites with video have increased conversion rates. And the most captivating thing about video is that when it is well done, it is incredibly compelling and drives audience engagement. Creating compelling thought-leadership video within a limited dollar and time budget is straightforward. The key is to harness the expertise that already exists inside your organization— by putting your thought leaders and subject matter experts (SMEs) on camera. We call this type of video TLoV—Thought Leaders on Video. We’ve been helping clients creating content for quite a while now, and they all have the same lament. “My subject matter experts are so busy, they don’t have time to create content.” For years I’ve responded that their subject matter experts are thinking about creating content in the wrong way. They believe that the content they create has to 1) be written and 2) match the standards set by peer-reviewed journal articles. This belief is erroneous, but telling them this doesn’t help SMEs escape from their own preconceptions. Since they can’t get over these hurdles, these organizations never produce any content that helps their organization build a tribe of followers—prospects who will turn to them for advice about all of the choices they’re facing. It’s not the case that your SMEs don’t know what they’re talking about. If a prospect showed up at your door with questions about whether they should hire you or one of your two biggest competitors, you’d find a way to get your SME in the room, wouldn’t you? And this SME would talk with them, and help them see the world in new ways, guiding them through the thicket of choices they’re facing. Along the way, they’d build up some trust with the prospect. As I’ve written before, this is the first of two exchanges in the buying cycle. It’s a crucial exchange, and SMEs are just the people to handle it. If it bears repeating, it’s really useful information. Your SME probably starts any conversation with clients by asking lots of questions. Just like a doctor, they’re trying to diagnose a specific situation. Once they’ve gotten a sense of the issues, they tailor their response. The specifics they discuss will depend upon each prospect’s individual circumstances, but woven among the specifics is general advice that is the same across all clients. For the SME it’s repetitive, but the people on the other side of the conversation don’t know that. Sure, this general advice is more valuable when it’s combined with tailored specifics—but recognize that it’s also quite valuable by itself. Now, if there was a steady stream of prospects, your SME would never find time to actually do any work, because they’d be helping convince these prospects to work with your organization. But… that’s the exact goal, isn’t it? We want to generate—and then sign contracts with—a steady stream of prospects. The challenge is to do this without tying up your SMEs 24×7. Video is one very effective solution, for three reasons. The first two deal with internal considerations. SMEs are used to talking to prospects and sharing their knowledge; video is just an extension of this “talking and sharing.” And SMEs tend to have different, more achievable standards for video than they do for creating whitepapers; they’re used to seeing videos of their peers giving talks or being interviewed. The third reason video can be so effective is related to marketing: videoing an SME takes the content and power of a one-on-one meeting and lets you share it with the world. In the next issue, I’ll show how changing technology has made video easier to make—so easy that you can do it in your offices, without spending a fortune. If you’re interested in exploring this content marketing hack but you’re not sure how to proceed, Forma can help. Call us and we’ll chat.